The injection of a solution into the vein with a very fine needle will cause irritation of the lining of the vein. In response, it collapses and is reabsorbed. Then, the surface veins are no longer visible. It requires 15-30 minutes depending on the number of areas being treated. No sedation or anesthesia is needed. Patients may experience mild temporary discomfort during the injection as the solution enters the vessel. This sensation resolves within minutes. Injection sites are covered with gauze and tape. Patients are encouraged to walk immediately after the procedure, and wear a pressure hosiery for 24 hours. The treated vessels gradually disappear over the following month. Sclerotherapy is a safe procedure with very few risks. The most common complication is the development of brownish pigment in the treated area which usually disappears within 2-6 months. If the veins are unsually weak, there may be some temporary bruising around the injection site. There is little risk of infection or bleeding from scerotherapy. You may require one to several sessions depending on the severity of the condition and the extent of improvement desired. Most patients can expect up to 90 percent improvement after 3-5 treatments. 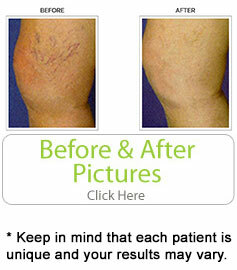 And to counteract the appearance of new spider veins, touch up treatments may be required every year or so. After the procedure, the patient returns home wearing the procedure dressing and pressure hosiery to prevent post-injection bleeding, as well as to promote healing. A healing interval (typically a month) must pass before another session. After each treatment, you will notice further improvement of your appearance.